AT&T Office@Hand supports an array of tested Polycom IP Phones which work well with your AT&T Office@Hand service. This article will guide you on how to Install Expansion Modules or Sidecars. For more information on setting up VVX sidecars, please check the device’s User Guide on the Polycom support site. The Polycom VVX 410 and VVX 500 are desk phones with color displays, gigabit Ethernet, and speakerphones. Up to 3 expansion modules (sidecars) can be attached to these desk phones. VVX Color Expansion Modules takes approximately 20 seconds to power up. VVX Expansion Modules with a paper display take approximately three seconds to power up. 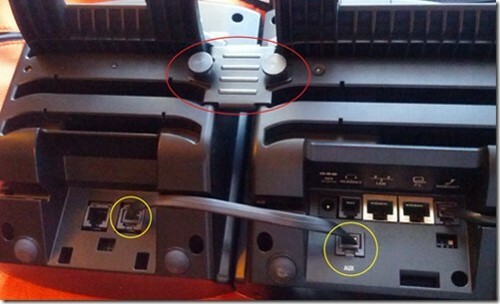 Align the back of the expansion module and the desk phone using the back plate. Fasten both devices to the back plate using the metal bracket and the thumb screws provided. Connect one end of the RJ11 Cord to the AUX Port of the desk phone and then connect the other end to the IN port of the expansion module. Note: The LED lights on the module’s line keys flash red and green as the module starts up. 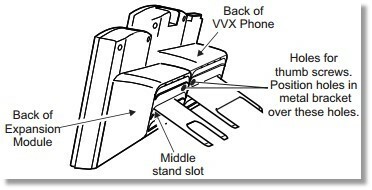 Attach the base plate to the back of the desk phone and the expansion module. Connect one end of an Ethernet cable to the LAN port of the desk phone and then connect the other end to the router.